HCM CITY (VNS) — Many well-off farmers in Ninh Thuan, one of the provinces in the central region hardest hit by drought, have dug and dredged wells, and donated water to other farmers to help them save their crops and animals. Nguyen Huu Tri in Ninh Hai District's Nhon Hai Commune, who owns the only well with water in his area, has shared his well water with more than 20 farming households in the Lon Spring area, Nguoi Lao Dong (Labourer) newspaper has reported. Tri is one of many well-off farmers in Nhon Hai Commune who have dug wells and given free irrigation water for other neighbouring farmers to save their crops. Near the end of last year, Tri's 4,000 sq.m field of grape plants was at risk of damage because of a water shortage as Lon Spring had dried up. Tri dug a 10 metre-deep well, which cost VND60 million (US$2,800). With the well water, he was able to save his plants and sell the harvested grapes, which were worth VND100 million, in February after Tet (Lunar New Year). Nguyen Ha, who uses Tri's well water to irrigate his grapes, said: "Without the help of Tri and his wife, my remaining grapes would all be damaged." Last December, 2,000 sq.m of Ha's 4,000 sq.m of grape plants were destroyed by drought. But with the new well, Tri let Ha use the well water to irrigate his grape plants. Tri recently purchased an automatic irrigation system for his grape orchard to save and share water with other farmers. Since March, youth from the Ninh Thuan Province Communist Youth Union have transported water to ethnic Raglai residents in the mountainous Bac Ai District twice a week. 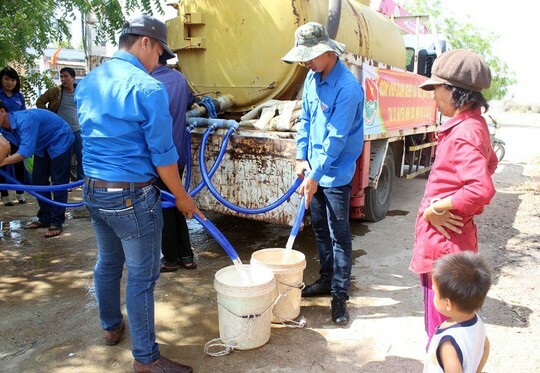 In Bac Ai's Phuoc Trung Commune, which was hit the hardest by the drought in Ninh Thuan, volunteer youth helped the elderly and children get water from the tank truck of the Youth Union of Ninh Thuan Enterprise Block. Chamlea At, a resident of Phuoc Trung Commune, said prolonged heat had lasted for more than a year. Hong Anh Dung, secretary of the Youth Union of Ninh Thuan Enterprise Block, said drought was expected to last for five to six months. The work of transporting water to drought-hit areas will last until September, he said. The cost of water transport is sponsored by philanthropists and youth members, he said. Chau Thanh Hai, secretary of the Ninh Thuan Province Communist Youth Union, said his union planned to send youth volunteers to drought-hit areas to dig wells for local residents. Tran Xuan Hoa, deputy chairman of the Ninh Thuan People's Committee, said the province appreciated the good deeds of farmers who shared irrigation water with other farmers and the work of youth union members who transported water to people in areas with the least water. The People's Committee also plans to transport water for daily use to mountainous areas, he said.